Promise to lay down with me. Promise to lay on the grass and watch the moon and stars with me. I don’t want someone who promises me the moon and stars. 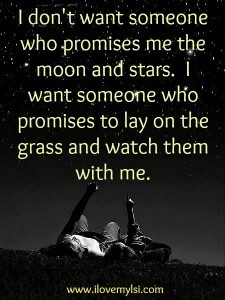 I want someone who promises to lay on the grass and watch them with me. So many promises made are empty these days that people have a hard time trusting anything that anyone says anymore. This seems especially true in love relationships where so many times it seems that promises are made one day and broken the next. When we are high on love, we often can’t seem to see the bigger picture as we have a hard time seeing or accepting the negative characteristics of the person we are in love with and/or the relationship itself. We can’t imagine how anything could possibly go wrong in a relationship with a person that we have literally made larger than life in our minds. I mean, what could possibly go wrong with Mr. or Ms. Perfect, right? So, many times, based on those feelings, we make promises that we cannot keep long term. We come off that initial love high and start seeing the person we are with and the relationship much more clearly and logically, giving us the ability to evaluate if this person really does fit into our lives and our future. More often than not, they do not and if we have made promises prematurely, we end up breaking them, and feelings are hurt to say the least. I have the deepest affection for intellectual conversations. Wise words spoken…..but lives adventures are the true testimony in one’s own mind. To live and to learn from those adventures makes one who they are depending on how they react and learn from the situation.